Advertisers are ramping up their efforts as the road to Super Bowl 50 is nearing its final stretch. 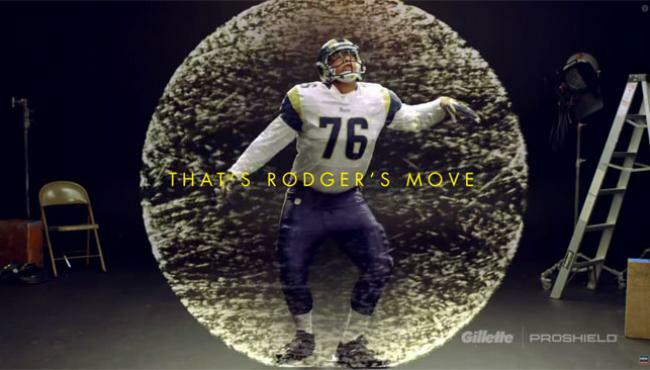 Gillett has released a new campaign for the Gillette Fusion ProShield featuring NFL Offensive Linemen in unusual movements - they dance. One ad features Rodger Saffold of the St. Louis Rams whose normal role is to shield the quarterback on the football field. In the commercial he wears his NFL uniform breaking out some badass dance moves. Gillette came up with a neat idea here. The Gillette Fusion ProShield Razor has lubrication before and after the blades to shield from irritation. The offensive linemen are shielding on the field and are rarely in the lime light. Gillette gives them a stage and publicity besides the cash. Besides Rodger Saffold of the St. Louis Rams, Gillette released a commercial featuring Trent Williams of the Washington Redskins and John Urschel of the Baltimore Ravens. Watch all three commercials below. It is not known if the new Gillette campaign is a warm-up for a Gillette Super Bowl 50 ad.